January 23, 2017- The Falcone Fine Art Studio has announced the availability of an edition of 'Acceptance', Tony Falcone's tribute to the inauguration of President Obama. Strictly limited to an edition of 440, these collectible prints are available unframed for $150, or framed for $300, shipping not included. Contact the Falcone Fine Art Studio for details! 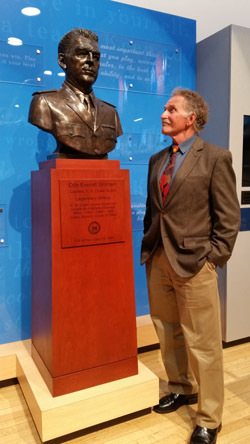 September 29th, 2016 - The U.S. Coast Guard Academy celebrated the opening of the Otto Graham Hall of Athletic Excellence with a Ribbon-cutting Ceremony highlighted by a commanding bronze portrait bust of the museum’s namesake, Otto Graham, sculpted by Tony Falcone of Prospect, Connecticut. The sculpture, displayed upon a pedestal of Pennsylvania cherry wood, captures both the rugged athleticism of Graham, renowned NFL Hall of Fame Champion, as well as the focused leadership of an athlete who in 1963 became a Captain at the Coast Guard Academy as well as Athletic Director and Head Coach of the CGA football team, leading the Bears to their first and only no-loss/no-tie season. The imposing Graham bust, Falcone’s first bronze sculpture of his 42-year career as a commissioned fine artist, stands 7’ tall on its pedestal and is 1.25 human scale. Though Falcone is widely recognized for his highly detailed historic paintings, murals and heirloom portraits, he has always felt that he harbored a sculptor within, just waiting to emerge. Bill Thompson, USCGA Alumni Class of ’64 and volunteer Chair of the Academy’s new sports’ facility project, envisioned the museum celebrating the theme “Leadership through Athletics”. Thompson, who was Captain of the CGA football team under Graham, tapped Falcone to create the sculpture after observing Falcone’s successful completion of a series of oversized oil paintings for the Academy’s Historical Murals Project commissioned by the USCGA Class of ’62 , a project that spanned over a decade, 2001 through 2012, and which required the Artist to work closely with CGA alumni, staff and personnel. Throughout the creation of the Otto Graham sculpture, Falcone worked directly with Thompson and a hand-selected team of Coast Guard staff, several of whom had known Otto Graham, along with the blessing of the Graham family. Utilizing a variety of photographs as well as memories of those who had known the football legend, Falcone created the sculpture in clay at his studio, first in miniature, and then the final bust to scale. After the clay bust was approved by Thompson and the CGA, Tony subcontracted and worked with George Mummert at his Foundry in Lancaster, PA to fabricate the bronze bust utilizing the “lost wax” process. A brief video of the entire project may be viewed on both Falcone’s You Tube site and his Studio website: http://www.falconeartstudio.com Falcone’s resulting bronze portrait bust of Otto Graham, illuminated 24/7, provides a fitting focal point for the new Otto Graham Hall of Athletic Excellence located within Billard Hall, an historic building re-purposed and designed by CGA Facilities Engineering/Derek Pisani; Murhpy & Orr Exhibits of Forest Park, GA; and Ames & Whitaker Architects of Southington, CT; and built by Construction Contractor, G. Donovan of Lebanon, CT.
On February 18, 2016, Artist Tony Falcone and Studio Manager Judith Andrews attended the Red Carpet VIP Reception for the Premiere of Walt Disney Pictures' production of The Finest Hours as guests of the U.S. Coast Guard Academy. The event was held at the historic Garde Arts Center in New London, CT in conjunction with the USCG Institute for Leadership forum featuring Senators Richard Blumenthal and Chris Murphy, Admiral Thad Allen, 23rd Commandant of the U.S. Coast Guard, and The National Coast Guard Museum Association. In addition, the entire Corps of Cadets was in attendance for the screening of this Coast Guard rescue film, deemed the most noted small boat rescue in Coast Guard history. Over a decade ago, Falcone completed and unveiled his monumental painting of the same rescue, entitled, "CG36500 Rescues the Crew of the MV Pendleton", one of ten oversized 10-foot canvases he had been commissioned to paint for the USCG Academy's Historical Murals Project (the painting may be viewed under the Paintings category of this website). Falcone had the pleasure of working with Bernie Webber, coxswain of the wooden lifeboat who made the rescue, throughout the creation of the painting as Bernie recreated the memory of that harrowing night in 1952 through the sharing of notes, sketches, conversations and visits to the Studio to approve progress, and the final painting. Falcone will be a featured panelist following the Public Screening of the Disney film on Thursday, March 3, at the Garde Arts Center in New London, CT (www.gardeartscenter.org) . 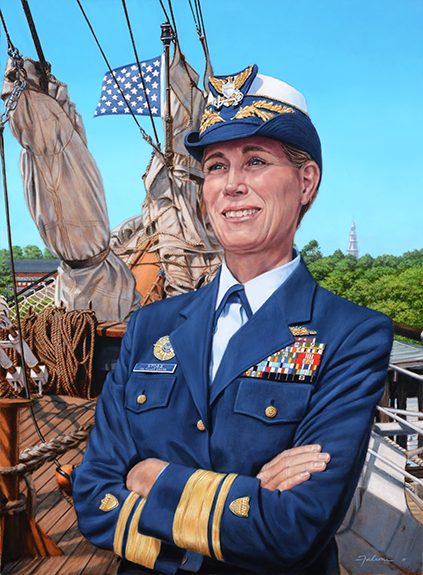 In October, 2015, during Homecoming weekend at the U.S. Coast Guard Academy in New London, CT, the Official Portrait of Vice Admiral Sandy L. Stosz painted by CT artist Tony Falcone was unveiled by the Artist and his subject, Vice Admiral Stosz. Stosz is the immediate past Superintendent of the U.S. Coast Guard Academy, the first woman in history to serve as head of one of the nation’s elite service training academies. The portrait’s unique composition reflects collaboration between Falcone and Vice Admiral Stosz, who both agreed that this portrait, like its subject, should break from past tradition. Rather than an interior pose, Stosz is depicted at the bow of “Eagle”, the USCGA’s tall ship which is shown anchored at the Academy against a recognizable landscape of structures including the chapel. 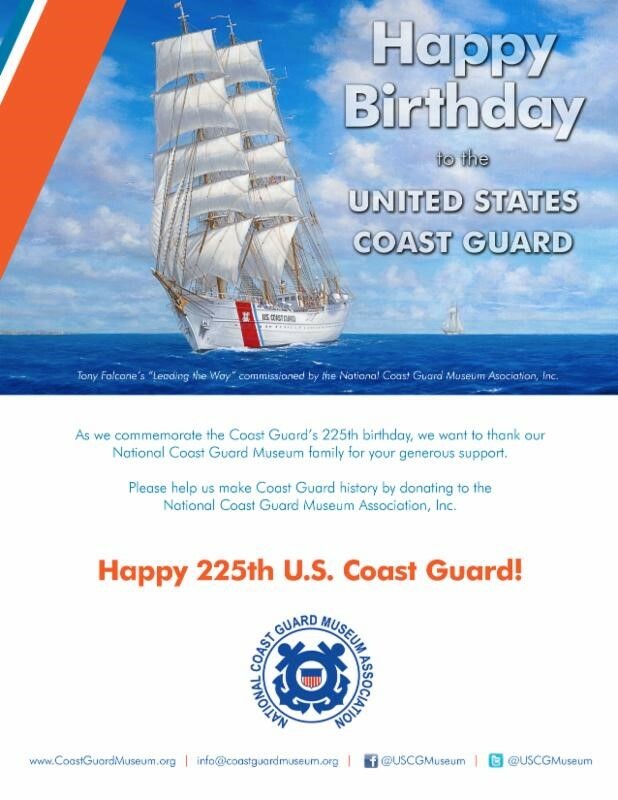 The U.S. Coast Guard Celebrates its 225th Birthday! 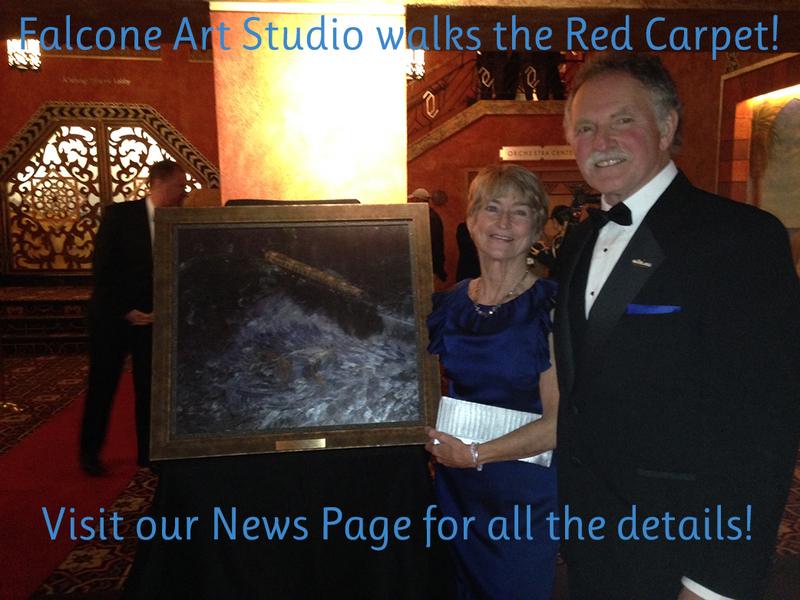 Artist Tony Falcone and Falcone Art Studio business manager, Judith Andrews, were invited guests at the August, 2015 birthday celebration for the Coast Guard in New London, CT. New London has just been designated a National Coast Guard City, one of 16 in the country to receive this official congressional and USCG Commandant-approved designation! Unveiling and Presentation of Bronze Portrait Bust of Otto Graham. Sculpted by CT Artist Tony Falcone, this portrait bust of NFL Hall of Fame Inductee, Otto Graham, was presented to the U.S. Coast Guard Academy in New London, CT by the USCGA Class of 1964 as its class gift on the occasion of its 50th Reunion during Homecoming in October, 2014. After retiring from professional football, Graham served as Athletic Director at the Academy, coaching the USCGA football team to an undefeated position. Pictured receiving the sculpture is RADM Sandra L. Stosz, Superintendent of the Coast Guard Academy. 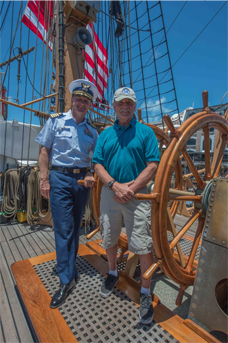 Captain Wes Pulver poses aboard “Eagle” with CT Artist Tony Falcone, his guest during an eight-day voyage from Jacksonville, Florida to Bermuda. 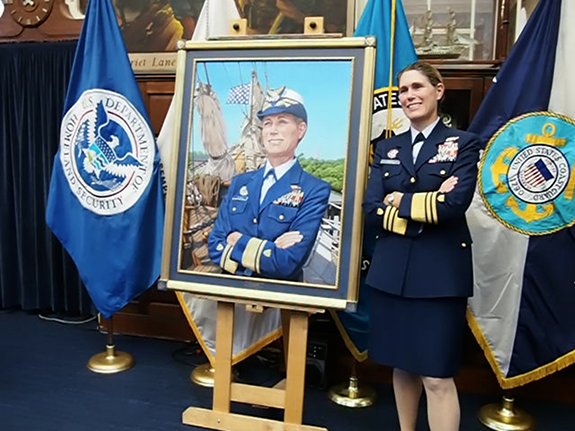 Subsequently, Tony was commissioned by the National Coast Guard Museum Association, Inc., to paint a fine painting/portrait of “Eagle” for use in its capital fund-raising campaign. Unveiling of Dr. Dorsey Kendrick, President of Gateway Community College, New Haven, CT: Artist Falcone unveils his portrait of Dr. Dorsey Kendrick, President of Gateway Community College located in downtown New Haven. 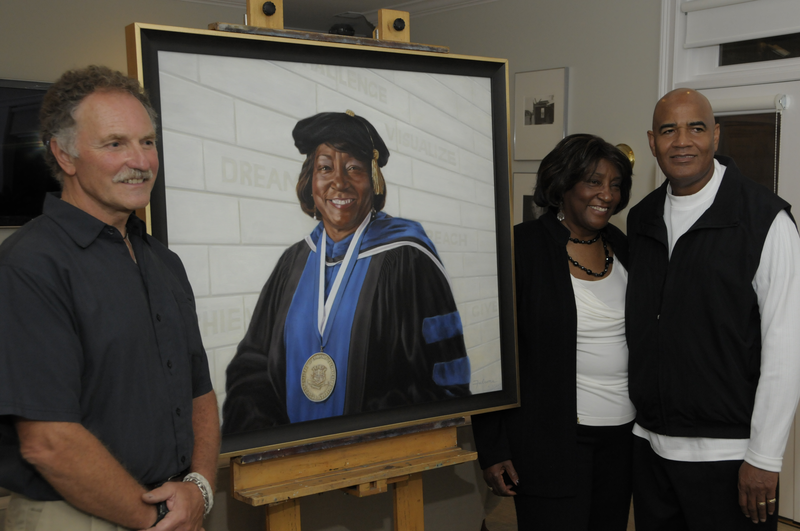 Dr. Kendrick is pictured with her husband and the Artist at the reception, after the unveiling. The portrait now hangs in the college Library. 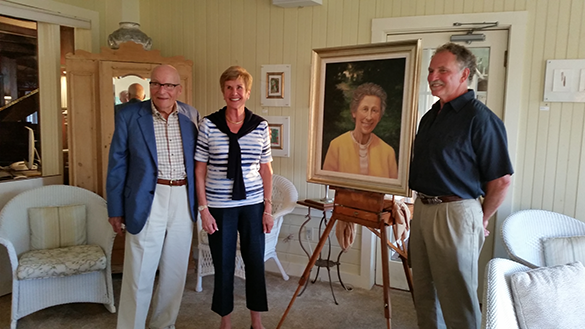 Falcone’s portrait of Elmina Sewall was unveiled by long-time friend of Ms. Sewall, Bill Curran of New Haven, CT and the Artist at the September 2015 annual meeting of the Elmina Sewall Foundation held at the Black Point Inn and Conference Center in Scarborough, Maine. Pictured with Mr. Curran and the Artist is Margaret Barbour of California, sister of Ms. Sewall. Falcone's painting of "9/11" displayed at the Intrepid Museum in NYC: Artist Tony Falcone displayed a reproduction of his painting of 9/11 at the Intrepid Museum in Manhattan in conjunction with NYC's 10th Anniversary of 9/11 held the weekend of September 11, 2011. Commissioned by the U.S. Coast Guard as part of its Historical Murals Project, the original Falcone painting, displayed at the U.S. Coast Guard Academy in New London,CT, depicts the critical role the Coast Guard played in commanding and implementing the evacuation of over 600,000 stranded individuals from lower Manhattan after the attack on the Twin Towers on September 11, 2001. 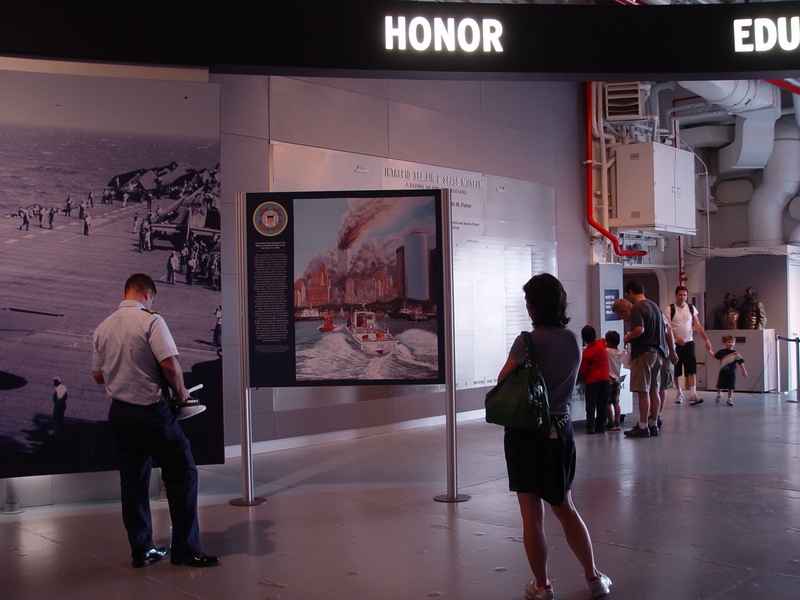 The ten year commemoration ceremony at the Intrepid Museum was held to identify and thank all branches of the armed services who assisted with the aftermath of that attack. A video entitled "All Available Boats", narrated by Tom Hanks, documents on film the evacuation activities of the Coast Guard which Falcone depicted on the 9 x 7 ft. canvas. Unveiling of D-day/Omaha Beach Painting at 65th Anniversary of D-day: Artist Tony Falcone unveils his painting of D-Day during ceremonies at the U.S. Coast Guard Academy in New London, CT on the 65th anniversary of D-day. The painting, entitled D-day Landings and measuring 10' x 10', is one of 10 paintings by Falcone commissioned by the USCG Academy, Class of 1962, for its Historical Murals Project. In this painting, Falcone depicts the role of the Coast Guard during WWII as they landed U.S. troops on Omaha Beach in Normandy on D-Day,1945. A number of veterans joined Falcone for the unveiling, including Al Green, pictured to the right of Falcone, who served on the LCI vessel depicted in the forefront of the painting. Mr. Green served as Falcone's "Champion" during the creation of this painting, providing oral history and memory to help with the design. 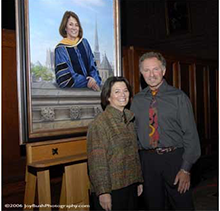 Unveiling of Portrait of Dr. Catherine Gilliss, Yale University School of Nursing: Artist Tony Falcone unveils his portrait of Dr. Catherine Gilliss in Woolsey Hall at Yale University in New Haven, CT. Dr. Gilliss, pictured with the artist, is the past Dean of the Yale School of Nursing, Yale University, New Haven, CT. The portrait was commissioned on the occasion of Dr. Gilliss' move from Yale University to Duke University to direct their Doctorate in Nursing program.